Steve Waguespack speaks at the Lions Club meeting. 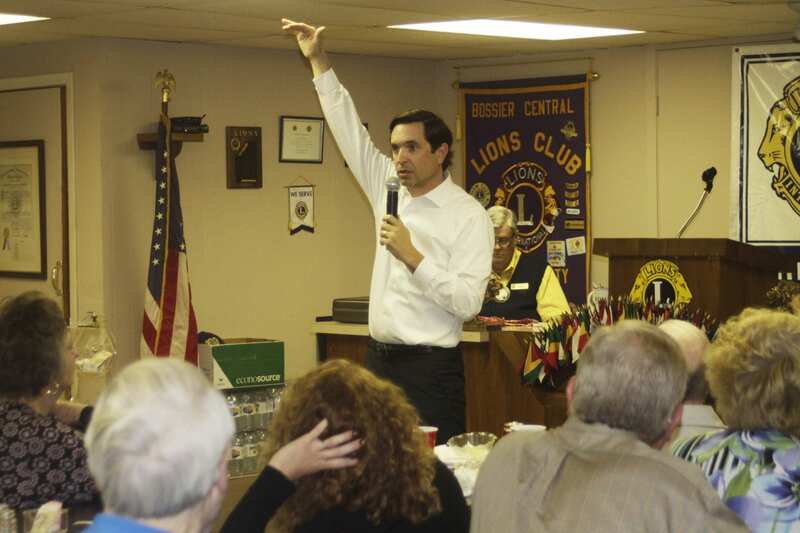 The Bossier City Lions Club got a fresh take on the state budget situation from Stephen Waguespack, the President and CEO of Louisiana Association of Business and Industry at its weekly meeting last Thursday. Waguespack explained that the “fiscal cliff” being discussed in Baton Rouge is a collection of temporary taxes set to expire July 1. And while much of the debate is centered on whether to renew those taxes, Waguespack said there is a larger issue at stake. Waguespack explained that the history of these budget issues goes back to 2005 and hurricanes Katrina and Rita. Waguespack went on to explain that much of that additional revenue was spent on things like teachers’ raises and higher education. But when those temporary dollars disappeared, the state treaded water for a few years, he said. Waguespack explained that sales taxes and income taxes are the two primary tools state lawmakers have to generate revenue. That’s why the temporary sales taxes were levied two years ago. But he said that continuing such taxes could hurt Louisiana’s business community in the long run. Waguespack said LABI is supporting a bill calling for a constitutional convention that could change the way the state’s finances operate. State Rep. Neil Abramson, D-98th Dist., introduced a resolution calling for a constitutional convention. That bill advanced out of committee last week.